"Download Fable II, the best-selling action role-playing game, in which you take on the role of a Hero in the fully realised land of Albion. Play through an epic story, become the world’s greatest fighter, gunslinger or mage. Explore dozens of open, unique environments with your faithful dog. Make friends, fall in love and start a family. Meet hundreds of characters and face some very tough decisions. 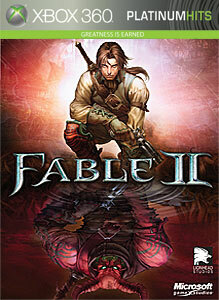 In Fable II, everything you do has a consequence."